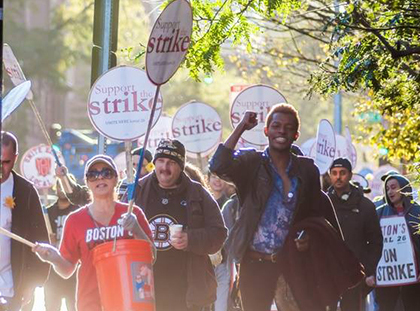 Striking dining hall workers at Harvard University were welcomed back by students late last week after a three-week strike that won them the right to a $35,000 “minimum salary” and halted all increases to health care costs, report the Harvard Crimson and the Washington Post. A longer piece in the Atlantic delves into the tactics of striking at the wealthiest university in the United States. “The nearly four-decade-old transition from employer-sponsored pensions to individual 401(k) plans has been a failure for all but the wealthiest Americans and ... something needs be done – soon.” That was the Los Angeles Times a few months ago, underscoring the importance of employer-sponsored defined benefit pensions – the traditional plans unions back. But, reports Capital & Main, the Times is attacking public-sector pensions, demonstrating how schizophrenic the discussion over pensions has become. The union representing UC clerical and food service workers is grilling UC over how low wages are leading to food insecurity, reports the Daily Nexus, UCSB’s student newspaper. UPTE’s Berkeley local has polled its members on whether they support a Berkeley Faculty Association (BFA) endorsement of former US Labor Secretary and current UC public policy professor Robert Reich as the next chancellor, or endorse principles to be observed in the selection process. A majority of members decided to join the BFA and United Auto Workers in endorsing the Robert Reich for Chancellor Campaign. Beating Republican nominee Donald Trump is “personal” for many Nevada workers in the culinary and food service unions who have worked in his casinos or hotels, reports the San Francisco Chronicle. Of course, next Tuesday, November 8 is election day. Find your early voting location or election polling place at the California Secretary of State’s website or by calling 800-345-VOTE. Need help researching the ballot? Here are UPTE’s recommendations on propositions and candidates, as well as links to the California Federation of Labor’s state and local endorsements, as well as the progressive Courage Campaign and the non-partisan CalMatters. Remember: UC provides 2 hours off for voting, if needed, whether you are covered by a union contract or by personnel policy. In many countries around the world, election day is a national holiday. Fortune reports that a growing number of private US employers – including GM, Ford, Patagonia, Spotify, Survey Monkey and Salon – are giving employees the entire day off to vote and do election work as part of a campaign called Take Off Election Day. Wouldn’t it be great if UC joined that campaign?